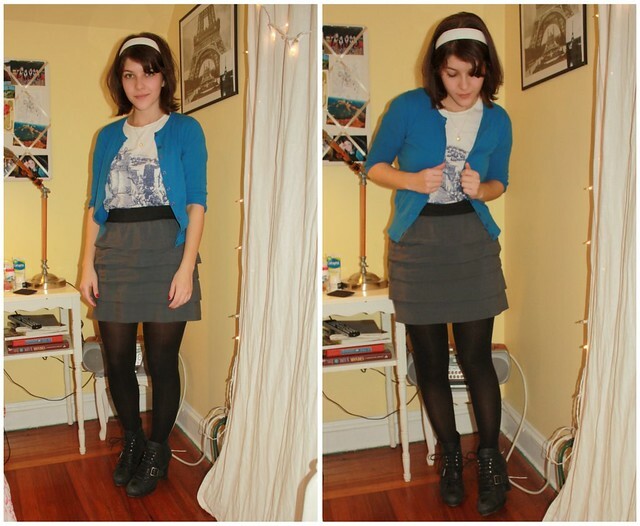 Here's what I wore to work on Monday! It really doesn't need much explanation. My tee shirt is from the mens sale rack at H&M, I had been looking for a nice cheap tee shirt to replace one that fell to pieces and for $5 I couldn't go wrong. I changed into flats for awhile, but my boots are so old and comfy it was only because I felt too tall in my office! Does anyone else feel awkward wearing heels in a casual office? I love mens tees but I think they don't suit me, to you is so lovely! and the headband makes you feel like a good little girl, cute! I adore this outfit! It is casual but so so cute! Those shoes are perfect! I have been looking for a pair just like these! I used to feel a little awkward wearing vintage heels to my high school haha...but I did it anyway! thanks for your lovely comment :) topshop is definitely taking over like abercrombie did, you are so right haha! how long have you lived in NY? i've always wanted to live there. 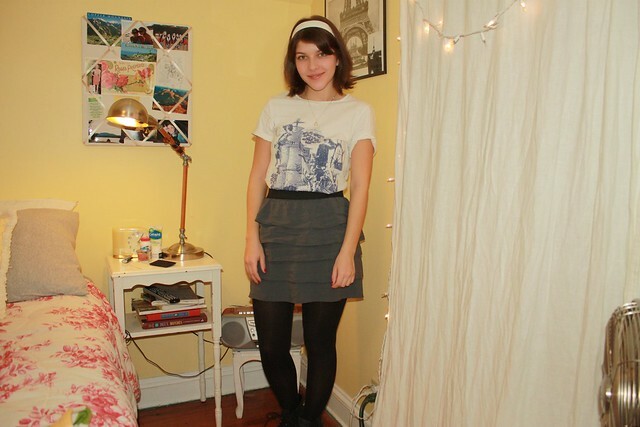 i love that you found this tee in the mens section, looks great with the skirt! hey girl, give me your shoes thank you very much! Way cute...love mens shirts...boots at the office is fabulous! love the tee!" x hivennn. i love this outfit! especially the shirt.